Our new series, ‘Featured Weddings’ brings you wonderful moments from weddings held at the finest venues across different cities. 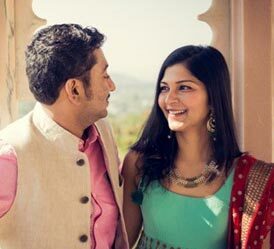 This presentation takes you to Kollam, Kerala, for the wedding of two self-confessed opposites, Swetha and Karan. Having chosen Kollam for its breathtaking backwaters, the couple decided to have their wedding ceremony on the water itself, with a perfect blend of cultures and traditions from the North (Karan) and the South (Swetha). Swetha remembers how they discussed the dream-like floating mandap with the planner, “We wanted a red and gold colour scheme, a mandap filled with red roses, the view of the breathtaking backwaters as backdrop.” Wearing a gold sherwani with red trim, Karan rode an elephant as he entered with his baraat. The arrival of the beautiful bride, wearing a classic red Kanjeevaram and traditional temple jewellery was announced by a 10 piece instrument, the ‘panchavadyam’. 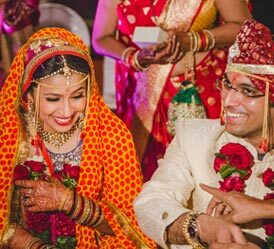 As a perfect sunset unfolded behind them, the jaimala ceremony was conducted and the couple walked to the mandap to exchange vows following the Arya Samaj traditions. Their reception, finale to the festivities, was a black-tie event with classic vintage décor. The walkway to the entrance of the hall was candle lit. The décor was simple yet elegant with a pastel color palette. DJ Ravish warmed the crowd up, bringing in the greatest hits from the 70’s and 80’s before raising the tempo with house, hip hop and selected Bollywood hits, keeping the party going into the early hours. Says Swetha: I was blessed to have Jaanmoni Das, a very popular celebrity make artist in Kerala who was available and willing to work her magic. She is a thorough professional who spent hours discussing every look we would create for each event. 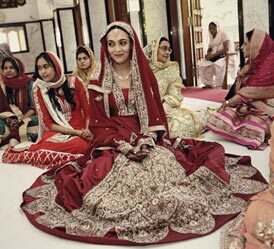 I think I looked my best on my wedding day and I am truly indebted to Jaanmoni. Morvi and her team have a way of capturing images that simply leave you speechless. Her work in black and white is timeless. The use of light in her color images seems to transport the viewer to the actual moment. Her work is hard to describe in words. She is incredibly passionate, easy going, straightforward and a wonderful professional who was easy to communicate with. She makes a real effort to get to know the couple and understands the value of time and deadlines. When it comes to wedding planning, Shana Selvam and her team (The Wedding Factor) are excellent at their work. It is obvious that Shana’s work is her passion as you watch her and her team spend hours planning. The team even created 3D renderings of the décor. Her meticulousness breeds confidence and she far exceeded our expectations. Spend a while talking to her and it is easy to see why The Wedding Factory is the right choice, no matter what or where the event.